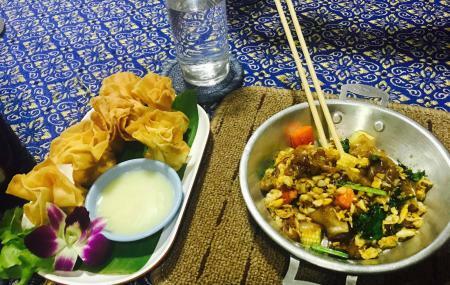 Find hotel near Siam Rice - The Cookery S ..
Thai food is unbelievably delicious and the Siam Rice Thai Cookery School offers the opportunity to learn to prepare authentic Thai food. This unique learning experience is an extremely enjoyable one and the friendly cooking experts here would guide you in each and every step of preparing a delectable Thai meal. The classes are generally kept small so that the instructors have enough time with each individual present in the class. They also offer pickup services depending on the location of your hotel. Leaning to cook lip-smacking Thai food for your friends and family is a gourmet souvenir which would leave an everlasting impression. Absolutely fantastic ! One of my favourite moment in Chiang Mai. You learn how to cook different dishes and you eat them each time. Our teacher Yam was very (very) funny and made our day ! First, we went to a local market near by and then we cooked during 4 hours. The place is stunning (local farm, you'll cook on the outside). The car picked-up at our hotel on time. Thank you Yam ! One of the best experiences of our trip so far. Everyone said we should take a cooking class and I’m so glad we took this one. Pot, the cooking instructor, was friendly, funny, and patient. His whole team was. We started off at a market where he explained different ingredients to us and then we had a chance to explore. We drove to his cooking space. We spent the evening learning how to cook an incredible variety of meals. Everything from the ingredients to the cooking materials was prepped and easy to use. I am not a great cook by any means, but I loved what I made (Tom yum, spring rolls, massaman curry, mango sticky rice, drunken noodles - you can pick from a ton of dishes to make.) Door to door drop of service too! They picked us up and dropped us off right from our hotel. Overall friendly, fun causal cooking class where I learned a ton. If you are looking for a cooking class in Chiang Mai, I would definitely recommend this one. This was an authentic learning session with Yam, who knows her Thai cuisine and ingredients 100%. Picked up at the hotel, taken to the market to get some pointers on how and what to shop for when making the dishes ourselves, and then for our lessons dish by dish. Farang have nothing to worry about, YOU control the heat, food can be as mild or spicy as you choose. Great experience. The friendliest set of teachers and staff, great recipes and a lovely relaxed and fun day, not to mention some great food. Absolutely recommended. Just don't eat much for breakfast, you'll need the space in your belly!